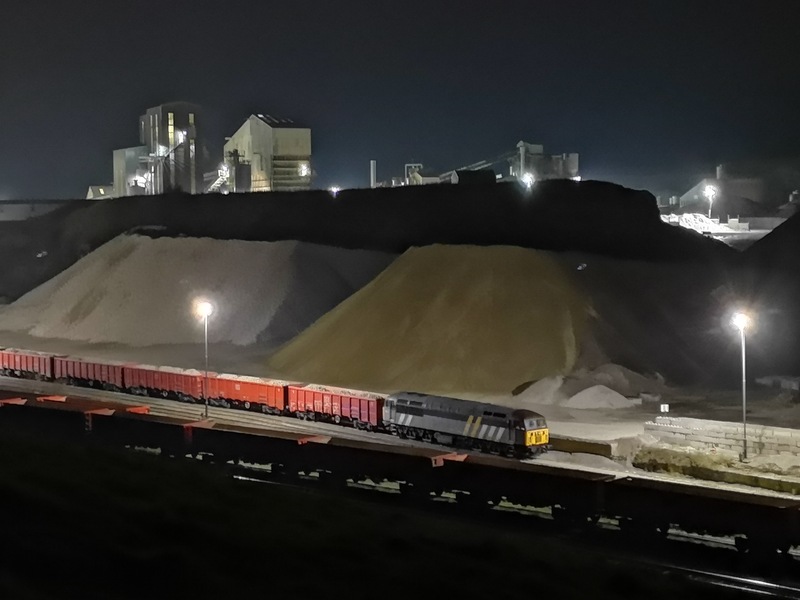 Another recent view of 56301, stabled at Peak Forest on the night of 24th November 2018. Photo copyright: Kevin Dowd. 0Z56 1000 Leicester L.I.P. – Longport F.D. 56312 rides again – Now unnamed and unbranded, DC Rail grey liveried 56312 returned to mainline service for new owners GB Railfreight earlier this week, working the 0Z56 Leicester LIP – Barrow Hill test run on Wednesday (21st November). 47749 went along for insurance and hauled it back to Leicester as 0Z57, the 47 itself fresh from receiving maintenance and in need of a test run ahead of charter train commitments this weekend. EMDC ‘Grids’ return home – After the originally planned movement did not transpire last week, GBRf trio 56018, 56098 & 56104 finally returned home to Leicester Depot on Monday (19th November), with the Rail Operations Group hauling them from Castle Donington EMDC using 47812. Former EPS generator coach 96371 was also in the consist, meaning that the sidings at Castle Donington are now once again empty.